Traverse the binary search tree using depth first search(DFS) recursive algorithm. If we were given a binary tree (not BST), then we need to traverse all nodes to find element. But, In case of BST, We are not required to traverse the all nodes of BST. At every node, we will take a decision whether to go towards left subtree or right subtree. Compare input value (45) with every node of BST. Input number is equal node data (We found the element). Find the element in left subtree. Input number is greater than node data. Find the element in right subtree. 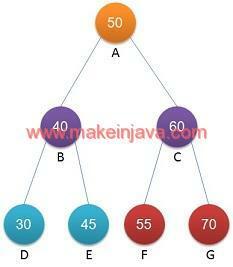 The condition to find element in binary search tree is as follows. 45 < 50 ? True , Traverse left subtree to find element (45). Got to node B (value at node B is 0) and equate with node data. FindNodeInBSTclass is used to find the element or node in a binary search tree (BST). Node class representing the node(s) of a binary search tree. 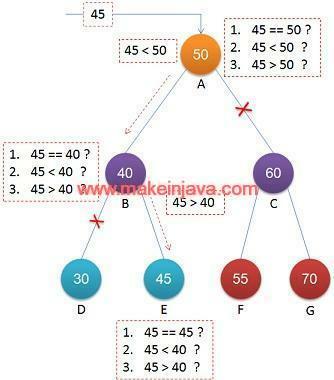 We are constructing binary search tree in a main method. We are calling the method of FindNodeInBST class, to find or search the node in a binary search tree.